Gideon, Missouri lies 20 miles west of the Mississippi River just off Interstate 55 between St. Louis, Missouri and Memphis, Tennessee. This places Gideon right in the middle of the Missouri Bootheel. The area is rich historically as Gideon was once a swampland southwest of New Madrid, the location at which Desoto set foot on Missouri soil in 1541. The area was settled by hunters and fur trappers until 1900 at which time a sawmill became the leading employer. This was vital in building the town of Gideon and also it became the leading manufacturer of wooden boxes in the United States during World War II. The "company town" built around Gideon-Anderson factory and the sawmill no longer exists as Gideon has become a suburb community for area towns with their active industries. 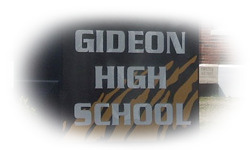 Families still choose Gideon for residence because of its excellent school system. Land once considered worthless swamp now yields farming crops such as cotton, soybeans, wheat, corn, milo, and vegetables.